Do not be fooled by cold-formed steel products that may look similar. 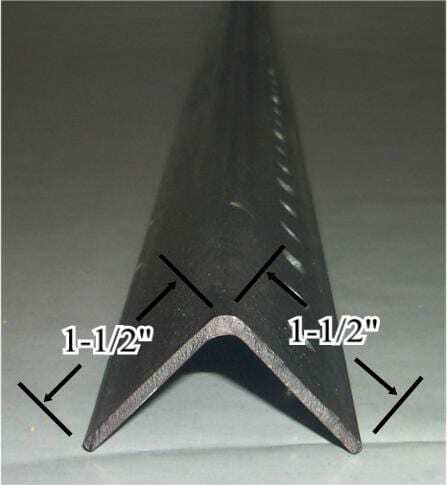 Standard low-carbon cold formed angles do not have comparable strength, and they will deteriorate rapidly. Nothing compares to the strength and longevity of high carbon rail steel. We normally inventory both 8' and 10' lengths. However, we will be happy to custom run other lengths to accommodate your style. As far as recommendations on length, keep in mind your intended purpose. Are you looking for support on trees already producing, or will you be tree training in addition to support? If you are merely "fixing" an old problem and just need to pull leaning trees back up, the 8' stake will do the trick. If you are starting young trees, there is a good chance that you will want to tie the leader up, tie the limbs down, and possibly tie up the heavy bearing "droopers". For this purpose, tree training with the fabricated 10' Best Angle stake is the most efficient system we have found. Best Angle Tree Stakes offer a full line of different sized high-carbon rail steel stakes to accommodate your needs. Our stakes are formed into the familiar shape of "angle iron". 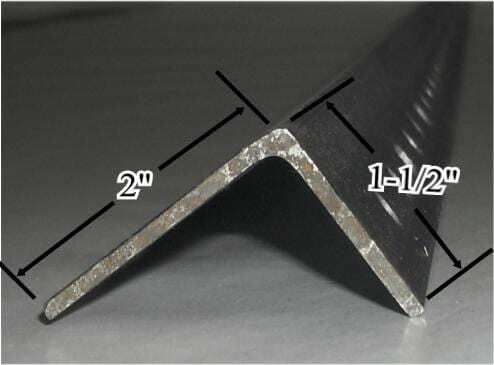 We offer very small angles, 3/4" x 3/4", up to very large and super strong angles of 2" x 1-1/2". 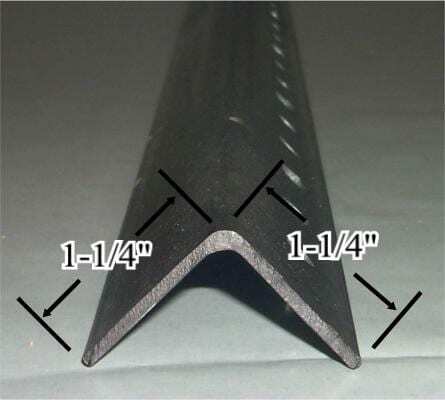 PB496-OR 8 ft. 255 5355 $5.46 $0.73 Recommended for heavy duty support. 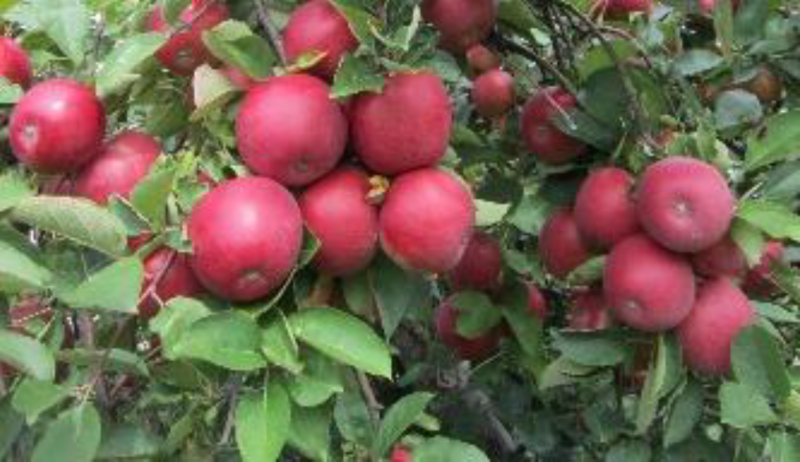 Popular for individually staking for rootstocks with precocity and weak basal strength such as M.9, Bud 9, M.26, Mark, M106. This is a very strong stake that supports tremendous loads, proven reliable through violent storms, and helps compensate for plans gone astray. The best seller for apples and brambles. 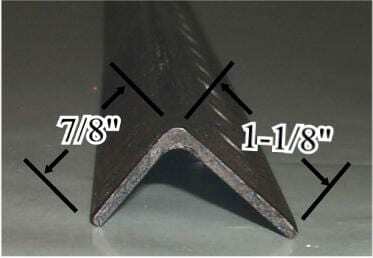 PA396-OR 8 ft. 255 6630 $4.65 $.66 Recommended for medium duty support. 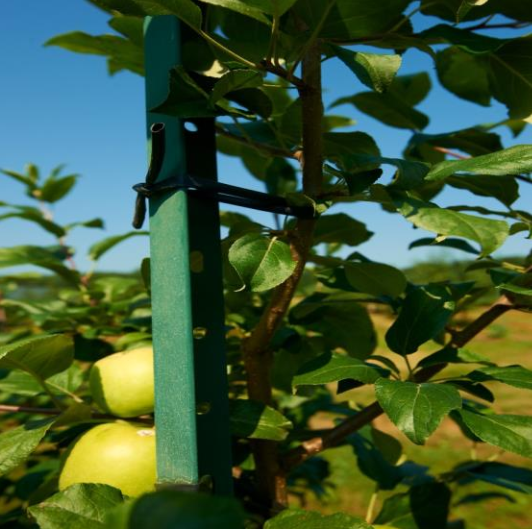 Popular for individually staking rootstocks such as Bud 9, M27, or systems that be kept compact. This stake also provides excellent use for training purposes on rootstocks that will eventually be self-supporting. PJ196-OR 8 ft. 400 8800 $3.54 $.55 Recommended for light duty support or supplementary support. We recommend this stake for use with wire trellises or for a single top wire system. While this stake is strong, we feel it is insufficient for individual tree support with bearing trees. Can be used with tomatoes and nursery stock! RG396 8 ft. 400 11200 $2.74 N/A Recommended for light duty support or supplementary support. We recommend this stake for use with nursery stock, ornamentals, or non-bearing trees. 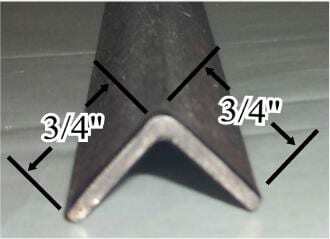 Due to the small angle width, this stakes is not available fabricated or painted. A great stake for tomatoes. Shorter lengths available upon order. Minimum quantities apply. PF996-OR 8 ft. 200 4000 $9.46 call for current Recommended for heavy duty support. This is a tremendously strong stake that is often used for trellis systems, in conjunction with smaller stakes, or with top wire systems. We often see this stake purchased to "fix" support problems where other materials were originally used, but failed under adverse conditions. A great stake for deer fencing. Holes are punched on 2" centers on one leg. Starting 2" from the top of the stake with two 5/16" round holes, followed by a single 5/8" x 5/16" oblong hole, the hole pattern repeats down the stake. From the bottom there is a 5/16" round hole at 24" and another at 30" to assure depth uniformity during installation. (No fabrication) means no holes, no paint. black, 100 meter roll $16.50 Strong, durable, elastic, non-girdling tie material. Stays pliable in cold weather. 3/16" diameter black surgical tubing. Available in 100 meter rolls Use this tubing to tie your tree to the stake. Make a figure 8. Lace the tubing through the hole in the stake then around the back of the stake crossing the tubing between the stake and the tree, then around the tree. To make an inexpensive dispenser, place the 100 meter roll in a empty gallon jug, then feed the tubing out through the cap hole. Using the jug handle, hang the dispenser from your belt . plastic $.22 plastic training clip - Specifically designed to lock into the holes of Best Angle stakes. 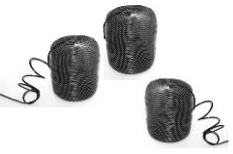 Holds 12-1/2 gauge wire, tubings, twines, strings, etc. to the stake. Use clips to provide a versatile attachment point when tying limbs up or down. Use to position wires when trellising. Attach wires to side of the stake. Clips allow adjustment for uneven terrain and prevent wire damage associated with placing wire directly through holes in the stakes. Best Angle will be pleased to provide quotations on custom lengths, sizes, and fabrication for greater savings. Price per stake applies when ordering standard quantities of stakes per bundle. See charts. Smallest quantity of stakes per bundle is 100 pieces. Bundles will not be broken. Prices F.O.B. Prices FOB in Montoursville, PA 17754	, PA.